I left the discussion of Ovid’s Metamorphoses by saying (as I often do) that, in literature, context is everything. We can’t really grasp the significance of Ovid’s version of the Great Flood unless we consider it in the context of the poem as a whole. So what is this poem really about? How does the early episode that recounts the Great Flood contribute to the overall meaning, and how does the overall meaning color the significance of the Flood account? The title hints at the poem’s meaning. 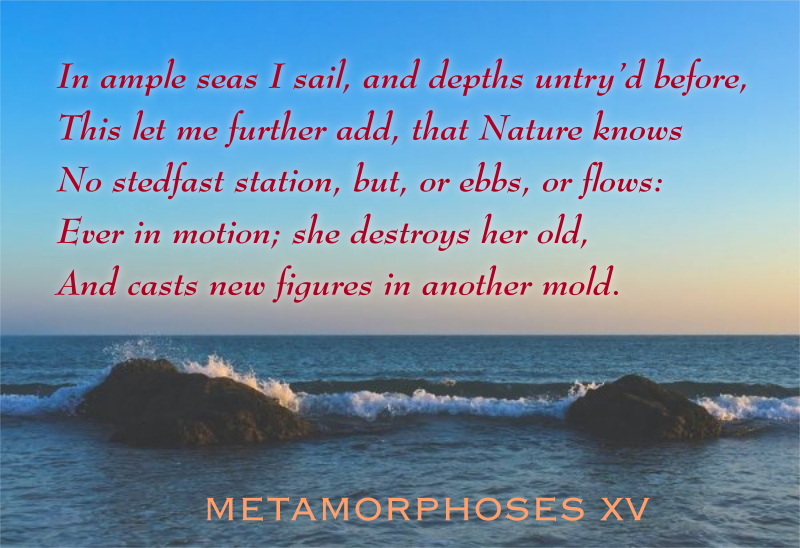 Metamorphoses covers all of history (and prehistory), starting with the creation of the world and ending in Ovid’s present day. What might seem, upon a first reading, a rather aimless stitching together of innumerable ancient myths is actually a very careful selection which is tied together by a single commonality: the metamorphoses themselves, one thing being changed into another. Most of these metamorphoses show the gods turning human beings into various non-human things – dolphins, trees, stars, you name it. And why do they do this? In large part, because gods are selfish, possessive – and immortal. When a god desires permanent possession of a mortal person, he (or she) can achieve that permanence only through change – by turning the unfortunate mortal object of his desire into something that can never die. In other words, the key to permanence is change itself. In case we have missed this point, in the final segment of the poem, King Numa, the successor of Romulus, the founder of Rome, listens to a long lecture by Pythagoras on the idea that flux (change) is the principle on which the whole cosmos is founded: things change into other things. Living things turn into dead things, the dead things decay (more change), the seasons change, everything changes. (The gods may be immortal, but they change their minds constantly.) Change is the one constant in the universe. Numa absorbs this lesson and returns to Rome, changed by the experience, a wiser man for having listened to Pythagoras. Then one king is changed for another, and so on through history, until Julius Caesar himself is murdered in the Senate and gets changed into a god (also a shooting star). So this is what the poem says: the cosmos is ruled by gods who, if they take a shine to you, are likely to turn you into something you don’t want to be just so they can hang onto you. And the world is ruled by kings who like to think they are gods. The good thing about kings is that they come – and they go. Things change – if things seem bad now, they might be better in a bit (and vice versa). This view, which pervades the poem, provides the context for Ovid’s account of the Great Flood, which shows how incredibly fickle the immortal gods can be: one minute they are basking in the worship of mortal man, the next minute they are destroying every living thing because one man behaved badly. To this extent, the Graeco-Roman gods are not very different from those in the Epic of Gilgamesh. The sole survivors of the Great Flood beget tough offspring. Now that we have taken a good look at the stories of the Great Flood in pagan literature, I hope we will be able to see the Biblical account in Genesis with fresh eyes, so that we can discern the significant ways in which the Bible story differs from these others. If you would like to read the entire series so far on the Great Flood in Literature, you’ll find all the installments so far here.